Joyetech eVic Primo Review - Daily Vaping Deals & The Best Vape Product Reviews at Vaping Cheap! The eVic series by Joyetech is a very popular line of box mods starting with the original eVic VTC Mini. This devices were known for being extremely affordable yet offering tons of features and being reliable. The original Joyetech eVic VTC Mini was a device I used everyday for quite some time before moving onto a new single 18650 box mod. Now, Joyetech has released a new addition to that line, the eVic Primo, which is much different in comparison to past eVic devices. Before getting any further into the review, I would like to thank CVapor for sending me this device for the purposes of this review. I will cover my first impressions, using this box mod over a period of time, performance, pros and cons, and conclude with whether or not I recommend the Joyetech eVic Primo! Click Here to Check Out the Joyetech eVic Primo! When first receiving the Joyetech eVic Primo, I noticed the simplistic packaging. It does remind me of the packaging from the original eVic devices. On the front of the packaging, you see an image of the device itself, and on the back it does offer some information. This type of packaging is fairly similar to what you would see with Wismec or Eleaf products. Even though simplistic, it does do a great job in keeping everything within safe and secure, which is surely a good thing. Upon sliding open the box, you are greeted with the Joyetech eVic Primo. My first impression of this mod was that it surely is good looking, and looks much more expensive than what it actually costs. This device is certainly one of the most elegant looking box mods within its price range. 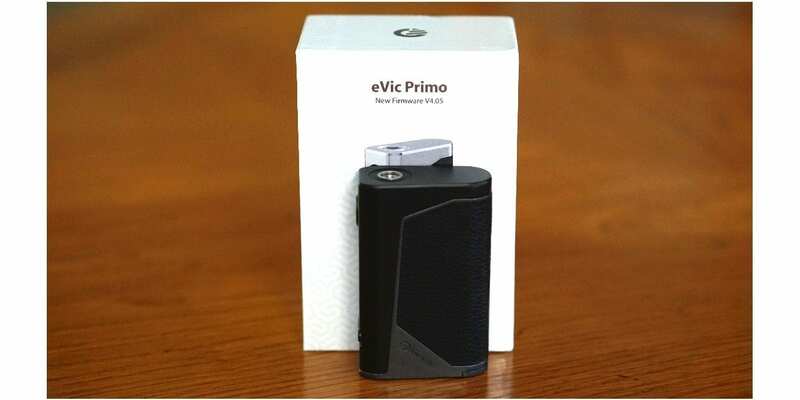 Also, the size of the eVic Primo isn’t that large either, which is a pro in my book. When first holding the mod, it immediately felt comfortable in the hands. I do have to admit I’m not the biggest fan of the stickers on the side. It’s kind of like a fake leather, but it does feel good in the hands. This is same type of sticker that is seen on the Joyetech Unimax 25 Starter Kit. Included in the packaging, you do receive the device itself, extra stickers, a micro USB cable, a user manual, a warning card and a warranty card. The Joyetech eVic Primo does require two high drain 18650 batteries for operation, which is not included. In addition, the way that it’s designed is what makes it comfortable. The front of the device (where the screen is) is wider than the back, so when holding it, it does contour to your hand. No matter which way you hold this device, it just feels comfortable in the hands. This is definitely a pro for me. 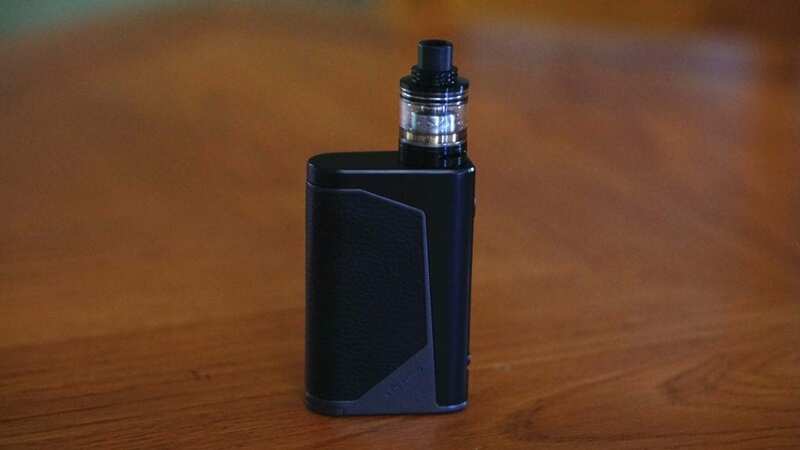 There are various colors available for the Joyetech eVic Primo including Black/Red, Black/Grey (the color I received), Bronze, Silver and more. Also, atomizers up to 25mm will sit flush with no overhang, which is definitely a big pro as well for this device since many atomizers being released to the market are 24mm and up in diameter. The screen itself is what you see with many Joyetech devices, so no surprise here. Even though this is the case, this is not a bad thing since many vapers are fans of their screen. It is quite large and easy to see as well. All in all, my first impressions of the Joyetech eVic Primo were all positive! Like mentioned previously, this is a good looking device and feels great in the hands! Using this device for two weeks as my primary dual 18650 box mod has been a pleasure. 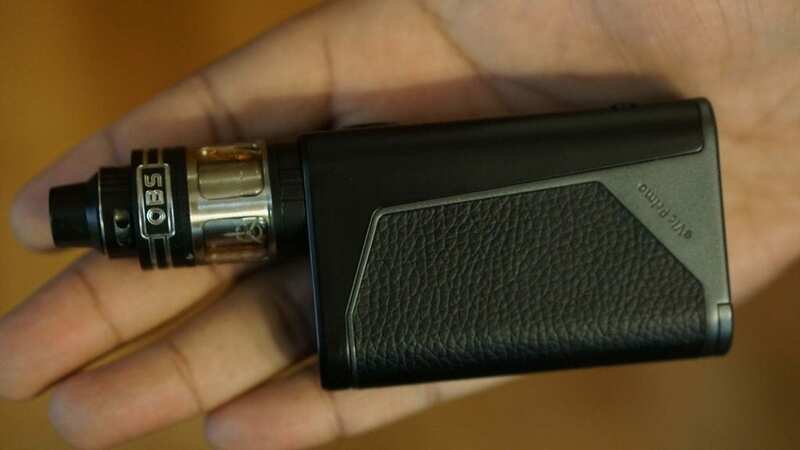 The size of the eVic Primo is just right for a dual 18650 box mod, and I’m sure whether you’re a male or female vaper, you’ll have no issues when it comes to the size of this device. Honestly, you’ll have no issues pocketing this box mod, or leaving it in your purse. Getting your batteries in and out is also a breeze. It does feature a sliding battery door, so all you have to do is slide the battery door open, and out comes your batteries. Simply, insert your batteries in the correct manner (there are positive and negative signs that are clearly marked), and slide the battery door back into place and it locks. I had zero issues with this battery door while using it as my daily driver. Replacing your batteries can literally be done in under 1 minute, which is a huge pro in my book. As mentioned in my first impressions, the Joyetech eVic Primo is extremely comfortable to hold and use. This is something that definitely added to my overall experience with this device, and is what kept me coming back. There are no sharp edges to be found with this device as everything is rounded perfectly. Not to mention, this device is light without any batteries installed, and when batteries are installed, it still keeps a fairly light weight. I definitely tip my hat to Joyetech for the overall design of this box mod, as this is probably one of the best designs they’ve done in my opinion. Navigating through the menu system is also incredibly easy. If you’re used to Joyetech or Wismec’s menu system, then this will feel at home for you. Five clicks will turn this mod on and off. Three clicks and you can navigate through the different modes such as Smart Mode, Bypass mode, and temperature control mode. This device does offer the V4.05 firmware which adds the real time clock, a preheat function, clock screen protection and a custom logo. Honestly, I didn’t bother with the custom logo or real time clock, but the preheat function is definitely a nice addition. Something worth mentioning is that when you take a vape and set the device down, it does change to the clock. Nothing major, but just something to be mentioned. I do like the clock feature, but honestly didn’t care too much for it. Also, something I know that will be asked in the comments is if I had any issues with the 510 connection. At first, I was worried that I would have issues with it due to the complaints seen, but I’m happy to say I never experienced any issues with the 510 connection with the eVic Primo I received. All of my atomizers made a connection and sat flush. Even some atomizers with slightly protruding 510 pins made a connection and fired with no issues. Feel free to let us know in the comments if you’ve experienced different. All in all, using the Joyetech eVic Primo has been nothing but a great experience. Even though I mentioned the comfortability of this device quite a few times already, it’s something that’s worth mentioning over again as it really is one of the most comfortable dual 18650 devices I’ve ever used. The Joyetech eVic Primo requires 2 high drain 18650 batteries, and has a maximum wattage output of 200w. As a vaper who primarily vapes under 100w, I wasn’t too concerned with the accuracy of up to 200w. Also, I do not have the necessary equipment to actually test whether this device can fire up to 200w accurately, but when vaping at higher wattages, it does feel like it’s giving the power you set it to. As with other Joyetech devices, this box mod does feature temperature control for Ni200, Ti and SS wires. 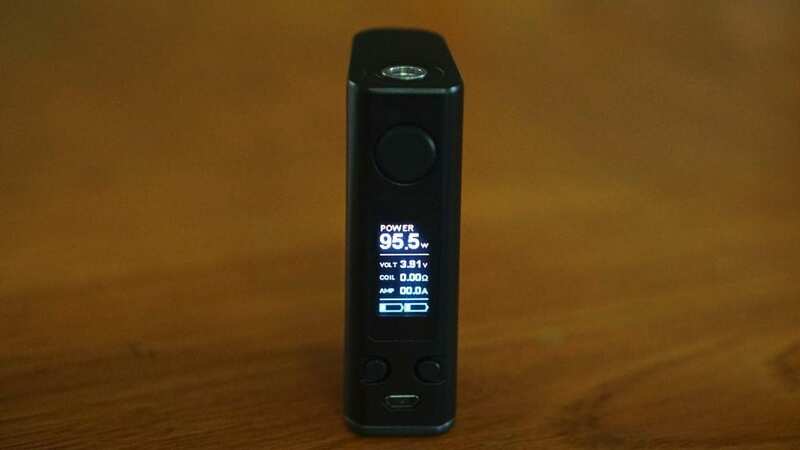 In addition, this device does feature a TCR mode, so you can easily fine tune your vape experience! When testing the eVic Primo in temperature control mode for stainless steel 316, I much preferred to use the TCR mode as it provided me with a better vaping experience. The standard stainless steel temperature control mode does work, but with the TCR function, you can definitely notice a difference in performance. The vape just feels a bit smoother, and is more accurate in my opinion. Also, I did use the preheat function quite a bit, especially with Clapton coils. It does work quite well, and it was something I was glad to have. This device is firmware upgradeable, which is a huge pro in my opinion! With dual 18650 batteries, you can expect good battery life. When vaping between 50w and 70w, I could easily get through most of the work day without needing to change batteries. However, if you do vape at higher wattages such as 100w and over, you can expect the battery life to suffer a bit. At 100w, I could get a few hours of battery life before needing to replace the batteries. Thankfully, changing the batteries is quick and easy due to its design. Also, something worth mentioning is that there is zero fire delay with the Joyetech eVic Primo. As soon as you hit the fire button, it fires immediately, which is a huge pro in my opinion. All in all, the performance of the Joyetech eVic Primo is as you’d expect, it simply works and works well! All in all, the Joyetech eVic Primo is a solid dual 18650 box mod that is very comfortable to use, and offers a ton of features. Everything just works great with this device, and I never experienced any issues with its performance. Also, the fact that atomizers up to 25mm sit flush with no overhang is a huge pro for this device! Even though there cons to be mentioned, none are major cons in my opinion. As mentioned previously, I wasn’t a huge fan of the stickers, but it doesn’t feel uncomfortable or anything. Also, even though the standard stainless steel temperature control mode isn’t the greatest, a TCR mode is available and the eVic Primo is upgradeable. For under $40, the Joyetech eVic Primo is definitely hard to beat. With its excellent design, and comfortability, I can easily recommend this device to any vaper looking for an affordable yet excellent performing dual 18650 box mod! I recently purchased one from 3fvape and received a early one with a bad 510.Be careful who you purchase it from and be aware joyetech or 3fvape will not stand behind this mod.